If a gem is something delightful that is a bit difficult to find but worth the effort, then Hollis Garden certainly is a gem. 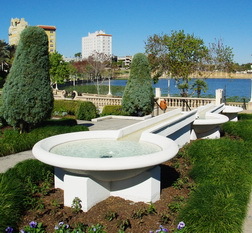 The city of Lakeland Florida has been undergoing a rejuvenation of its original downtown and the creation of this 1.2 acre garden is a wonderful part of it. Donated by the Hollis family it is located on the promenade around Mirror lake which occupies the centre of this historic town. If you love visiting other gardens as much as I do then do not allocate your time by the size of this little gem. It takes much more time to investigate the many delightfully crafted, corners, crevices and garden rooms, than its seemingly small size would indicate. The basic premise of its design is a history of horticulture/agriculture in central Florida but I was hooked as we approached its main gate. Hanging in a large tree were a couple of old friends of mine, in the form of large Staghorn ferns, Platycerium bifurcatum. There are several other species in cultivation but this is the most common. They were about 1 - 1.5 M (3-5') in diameter and reminded me of the huge one I used to keep in my greenhouse. Anyway, any garden that is growing a few of these must be one that is worth visiting. Let’s get back to this garden’s design. There are some quite large, bright white, formal structures at the high point of the garden. 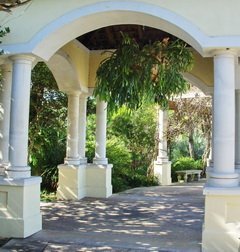 These columns and porticos are a delightful entry way and just happen to hold another large Staghorn. There is a series of ponds and streams that wind their down from this formal area, eventually winding up at the bottom and running into Lake Mirror. They tie the historical areas together with running water which is the common thread that supports all of this horticultural activity. The first area, of course, is a collection of plants that are native to the area and then we wander into a couple of rooms that celebrate the production of food crops that quickly developed in this wonderful climate. The many areas of ornamental horticulture that can thrive here occupy a fairly large section of the garden with an amazing diversity of plants. 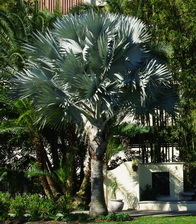 Now, for a northerner, I’m a bit of a Palm fancier and Hollis Gardens had the usual collection of local palms but standing out from them were two pair of delightful and unusual gems; the large bright blue/grey palmate fronds of the Bismark palm Bismarckia nobilis are visible from almost any point in the garden. The equally interesting but somewhat more subtle beauty of the Triangular Palm, Neodypsis decaryi is discovered on the opposite side of Hollis Garden. 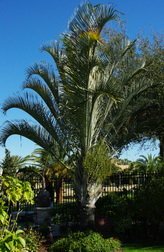 It’s called the Triangular Palm because its long pinnate fronds grow out of the trunk in three distinct rows leaving a very triangular shaped trunk. On the way back around the outside wall of this garden you follow a bark chip path through a grove of rather nondescript trees. The signage, or our wonderful guide, quickly point out that they are all fruit trees. This amazing array of edibles, from Carambola to Loquat is a wonderful teaching tool. It lets us northerners see where these fruits actually come from and gives the locals some great ideas for dual purpose plants for their backyards. 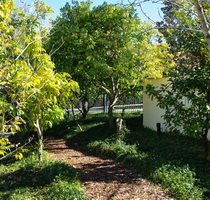 Our tour was all too fleeting, as is this description of it, but Hollis Garden is certainly on my list for a longer visit the next time I escape our winter for the delights of Florida’s Polk county. Just around the lake from this garden is the wonderfully restored Terrace Hotel and its dining room is the perfect place to start or finish a tour of downtown Lakeland. I can personally confirm that the french toast made with fresh croissants and maple syrup will give you enough, delicious, caloric intake to sustain a long tour of the area.